Home » CJSF Record Club Returns with "The New Wave of Contemporary Jazz"
This Nov. 29, the CJSF Record Club - CJSF's (somewhat) regularly-scheduled series of auditory delights - returns! Drop by the station (located in room TC-216 below the Rotunda on SFU Burnaby campus) from 5 to 7pm and tickle your ears with fine sounds curated by music lovers at CJSF 90.1 FM - pizza will be served, too. Join Peter Prentice of the Jazz Spectrum (Sundays from 8-9a and Wednesdays from 6-7p) for this month's #RecordClub as he showcases the most exciting young talent working in the genre today. 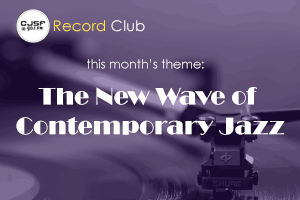 Please visit the CJSF Record Club #8: The New Wave of Contemporary Jazz Facebook event page for details on next week's #RecordClub. Questions, kudos or suggestions (musical or otherwise?) Send us a direct message on your social network of choice or email cjsfmusc@sfu.ca!